In April of 1925, Duggan and Bill Dwyer, New York City’s most-celebrated prohibition bootlegger, were awarded the franchise for New York. Somewhat fortuitously given the shortage of players, the Hamilton Tigers, who had finished first the season before, had been suspended from the league after they struck for higher pay. However, the suspensions were quietly lifted in the off-season. Soon afterward, Dwyer duly bought the collective rights to the Tiger players for $75,000.He gave the players healthy raises—in some cases, double their 1924 – 1925 salaries. Just before the season, Dwyer announced his team would be named the New York Americans. Their original jerseys were covered with stars and stripes, patterned after the American flag. Although he acquired the Tigers’ players, Dwyer did not acquire the franchise; it was expelled from the league. As a result, the NHL does not consider the Americans to be a continuation of the Tigers—or for that matter, of the Tigers’ predecessors, the Quebec Bulldogs. The Americans entered the league in the 1925 – 1926 season along with the Pittsburgh Pirates. The Americans and Pirates became the second and third American-based teams in the NHL, following Adams’ Boston Bruins, who began play the previous season. The Americans made the playoffs again in 1938 – 1939 and 1939 – 1940 seasons, but were bounced in the first round each time. Canada entered World War II in September 1939, and some of the team’s Canadian players left for military service. However, an even large number of players entered the military in 1940 – 1941. With a decimated roster, the Americans missed the playoffs with a horrible record of 8–29–11, which was the worst in franchise history. While the league’s other teams were similarly hard-hit, Dutton was still bogged down by lingering debt from the Dwyer era. This debt, combined with the depletion of talent and wartime travel restrictions, forced Dutton to sell off his best players for cash. The Amerks were clearly living on borrowed time; it was only a matter of when, not if, they would fold. The New York Americans were a professional ice hockey team based in New York City, New York from 1925 to 1941. They were the third expansion team in the history of the National Hockey League (NHL) and the second to play in the United States. 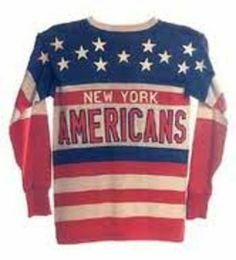 Americans – Colloquially known as the Amerks, as owner Bill Dwyer announced his team would be named the New York Americans. Their original jerseys were covered with stars and stripes, patterned after the American flag. 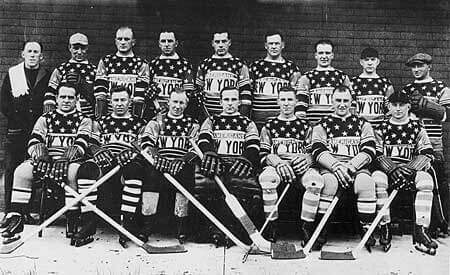 The New York Americans were a professional ice hockey team based in New York City, New York from 1925 to 1941.